From improving the quality of a new horizontal bandsaw, to adding fire extinguishing equipment, to a near zero-cost generator, to restoring an old leaf-digit clock, to making a 200 litre drum trolley to carry rubbish out of the workshop – it’s all here! Many power tools, although now very cheap, have some rough edges that can easily be improved on. 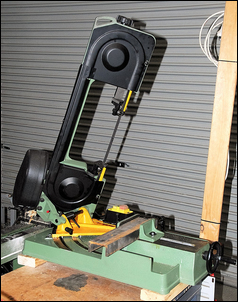 This newly-purchased metal-cutting bandsaw is no exception. To improve this, two modifications were undertaken. 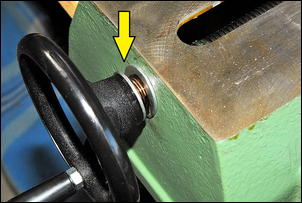 Firstly, a larger thick steel washer was used beneath the head of the bolt (arrowed). Secondly, the rectangular nut that the jaw bolts to (and that rides in the slot) was shortened a little with a grinder, so that the jaw is pressed firmly against the slide when the arrowed bolt is done up tightly. Another shortcoming was that there was a lot of back-lash in the vice handle. This was because the whole handle and jack-screw thread could move back and forth – there was excessive end-play. It didn’t change the accuracy or clamping of the vice (it still did up tightly) but it felt pretty awful. 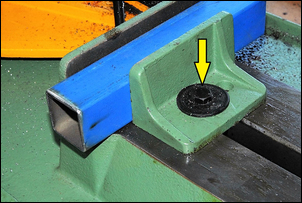 To improve this, two washers were placed on the jack-screw, sandwiching a spring. (You couldn’t just use washers alone, as the handle and face of the base are not parallel.) This removes most of the longitudinal play in the shaft. 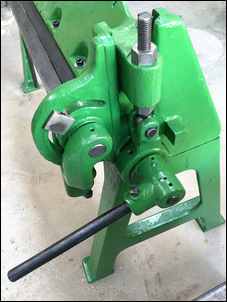 The springs and washers are oiled to promote easy rotation. 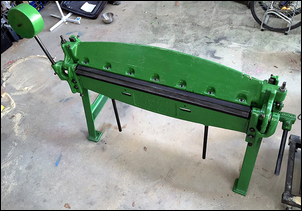 However, holding the ends of the ground blade together with the right overlap and in-line when brazing is quite difficult – so explaining the jig. 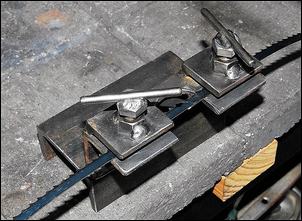 The jig is made from steel angle and channel offcuts, with the clamps comprising just nuts and bolts suitably welded. A straight-edge could have been added against which the blade could be pressed, but it’s quite easy to use a steel rule as the aligning straight-edge. Don’t forget to leave room in your design for the welding torch! It’s easy to become blasé about the risk of fire in a home workshop. But the other day I had a few wake-up calls. One was when I was using a plasma cutter and set a small rag smouldering; the other was some paper that caught fire when subjected to the sparks from a grinder. In each case, the fire was put out by just stamping on it – but you start wondering what could happen. So I decided to spend a modest sum and put some fire precautions in place. The first thing I did was to buy two ABC-coded 2kg fire extinguishers. These are suitable for the range of fires (burning paper, wood, liquids, gases, solvents and electrical equipment) that you might expect in a home workshop. The extinguishers came from the local big hardware store; the signs I bought on eBay. 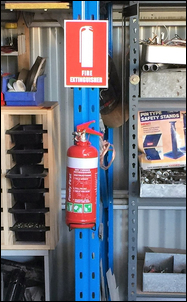 One extinguisher is near the welding bench, and the other near the personal access door, on the other side of the shed. I bought four galvanised buckets, degreased them and then spray-painted them red. I then used a paper stencil made up from a web-sourced ‘stencil font’, printed out and then cut suitably. A small amount of white spray-paint through the stencil, some sand from the local river crossing (and the amount you need is so small a local garden supplies depot would probably give it to you for nothing) and my four fire buckets were ready – at one-quarter of the price of the commercial metal fire buckets! For little fires, just extinguish the flames by smothering them in sand – the sand cuts off the supply of oxygen. 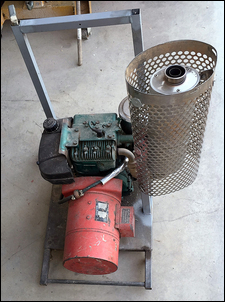 This mains power generator – believe it or not – came free from the local rubbish tip. It uses an 8hp Briggs and Stratton four-stroke engine and a 3kVA alternator. Pretty good for nothing, huh? I thought so, although not being much good with small engines, I gave it to the local garage man and he got it up and running. However, it was then as noisy as some enormous truck, so I added a motorcycle muffler (again from the local tip) and then a perforated stainless steel heat shield (cut-down from a truck muffler heat shield that was given to me) placed around the muffler. I’ve also replaced the fuel tank and fuel line, and added a fuel tap. So it’s no longer free, but still a darn good thing for the total expenditure. Don’t assume because someone has thrown it away that it’s no good…. If you do anything in sheet metalwork, two manual machines will make your life much easier. One is a metal folder, and the other a sheet metal guillotine. Bought new, both will cost you a considerable amount, but bought second-hand, they will be much cheaper. Shown here is my restored John Heine metal folder. I bought it at about half the price of a new one, then subsequently pulled it apart, cleaned and painted it. Note that these tools are really heavy – perhaps 300kg or more. To move it around, or to pull it apart to rebuild it, requires a crane – I used a hydraulic engine crane. It restored beautifully and now does precise work. When you restore a machine like this, you realise that the quality is nothing like cheap machines of today. The plain bearings are huge, the castings massive, and the whole construction immensely rigid. 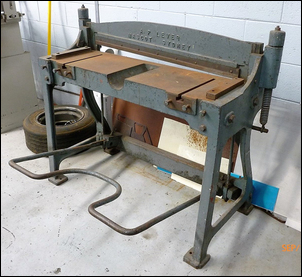 A recent acquisition is this sheet metal guillotine. It’s at least 62 years old (the company that made it closed in 1954) but, like the folder, it is fully adjustable to take into account any wear. It should restore as well as the folder – and be good for another century or so of work. Always inspect old machines carefully, but there are certainly bargains to be had. Not in the same field as the other equipment mentioned in this story, but…. 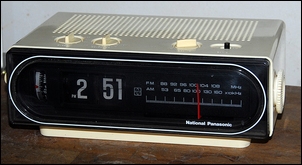 Here is a flip-leaf clock that I picked up for a few dollars at a charity shop. I fitted a new light, polished the plastic case (using car cutting compound), then tuned the adjustable ‘slugs’ in the AM radio stage. I am using it on my desk but it would actually make a very good workshop clock – the display can be read from many metres. 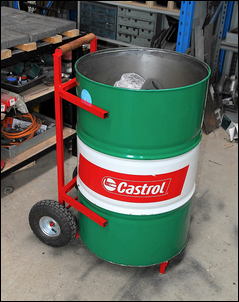 My local garage discards these Castrol 200 litre drums. I took one, cut out the lid with an electric jigsaw, ground back the sharp edge, then used it as a workshop bin. But how to get it to the trailer, so the contents can be taken to the tip? I picked up some cheap pneumatic tyred wheels, bought an axle to suit, then made a frame from square steel tube – seconds, so quite cheap. For fun, I turned-up a handle on a new (second-hand) wood lathe we’ve recently acquired. The result? A smooth-wheeling trolley. Looks good, works well – and the drum holds a massive amount of rubbish.